Some people are naturally good at finding the loopholes so that they can get around something without actually breaking the rules. For others it is easier to just follow the rules in front of them, rather than constantly search for some sort of loopholes. 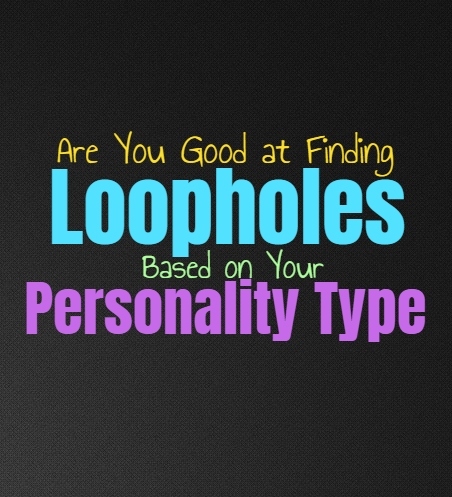 Here is how good you are at finding loopholes, based on your personality type. INFJs are often capable of finding loopholes when it is something which truly means a lot to them. They don’t want to let themselves back down and simply follow rules which don’t make sense to them. INFJs have a hard time with certain rules which seem wrong, and so sometimes they do search for loopholes so they do not have to adhere to them. INFJs are also willing to break the rules sometimes though, and this might be easier for them than trying to find loopholes. ENFJs are willing to search for loopholes if they need to in order to get what they want. They care about tending to their loved ones, and will do whatever they must to help them. In these situations they certainly can search for loopholes and ways to bend the rules a bit in order to really make a difference. ENFJs don’t really like breaking the rules when it seems unnecessary, and so sometimes loopholes can be a more useful way to work around things. INFPs are definitely good at finding loopholes and even enjoy being able to do this. Sometimes they prefer to break the rules, simply for the sake of making their own choices and doing what is right, but sometimes they realize that loopholes are best. INFPs are actually rather analytical people, and so they enjoy look at the different angles of a situation. They will find a way to uncover different ways to work around the rules, especially if they don’t agree with them. ENFPs definitely enjoy finding loopholes and they can be great at it. They are willing to bend the rules a bit and even find ways to go around them without being blamed for their actions. ENFPs enjoy navigating these situations and can be rather analytical people. They sometimes think about the loopholes of a situation just for the sake of learning about it the possible outcomes and paths they can take. INTJs are definitely capable of finding loopholes, and they would often rather do this than to break the rules. INTJs realize that sometimes breaking certain rules is only going to lead to trouble, and so they don’t want to do this. INTJs will use loopholes to help them achieve their goals and work around something which they don’t believe in following. They rarely just accept that they cannot accomplish their goals and so they use their minds to work around this. ENTJs are focused people who don’t like allowing anything to stand in their way. They are often willing to search for ways around their struggles, especially when it comes to working towards something which is important to them. ENTJs are highly analytical people, and so they can often use their minds to find these loopholes. ENTJs are also great at preparing for situations, wanting to be efficient in everything they do. Instead of allowing the rules to stand in their way, the ENTJ is often skilled at uncovering the loopholes which can aid them in moving forward. INTPs are not focused on following rules, since they really don’t like feeling controlled. They want to feel like they are free to explore their options and to learn from them. INTPs are certainly willing to and capable of uncovering loopholes. They will analyze a situation and work around it, so that they can figure out the best choice for moving forward. They don’t like simply following a path which is expected of them, and aren’t naturally rules followers. ENTPs are not naturally rule followers, they are often willing to work around a situation and uncover loopholes. They are analytical people who enjoy looking into a situation and want to find a way to uncover the different paths they might take. For them sometimes following the rules is a bit too boring and leaves them feeling trapped. ENTPs truly enjoy uncovering loopholes, since it helps them challenge themselves. ISTJs are normally rule following people who don’t really like needing to find loopholes. They would much rather focus on getting things done their own way, and doing it the way it should be done. They don’t want to break the rules or bend them and find that they have gone against something which can lead to failure. ISTJs are sometimes willing to find smaller loopholes when they absolutely must, but ultimately this isn’t something they prefer. ESTJs are rule following people who don’t like breaking the rules and causing problems for themselves because of it. At the same time ESTJs don’t want to fail or be held back from their accomplishments and so they want to find ways to work around whatever is stopping them. Sometimes loopholes are the best way for the ESTJ to get what they want and achieve their goals without breaking any rules which might get them into trouble. ISFJs often prefer to follow the rules rather than try to work around things. They want to be able to achieve their goals but they don’t like going against what they feel is right. ISFJs often prefer rules in their lives, since they help them to keep organized and focused. They care about their loved ones and will often do anything to help them, and so in these situations they might be more inclined to uncover loopholes. ESFJs really don’t have much trust in the idea of searching for loopholes, since they care about doing what they feel is right. They want to be able to take care of their loved ones no matter what, but they also don’t like breaking rules or going against what they believe in. For the ESFJ it is often better to follow the rules, and try to find a way to get things done and achieve their goals without breaking them. ISTPs are not naturally rule followers and so they are willing to go against what is expected of them. Sometimes ISTPs will prefer to break the rules, rather than to find loopholes around them. ISTPs don’t mind breaking a few rules, especially if it is exhilarating for them. They seek out inspiration and excitement in their lives and really don’t like stagnancy. ISTPs are sometimes willing to uncover loopholes though, especially when the situation would benefit from not breaking the rules but just bending them. ESTPs don’t really mind breaking rules, especially when they are excited about something or seeking a bit of change. When they are in a situation where they need to follow the rules but those rules are standing in their way, then the ESTP will work towards finding a few useful loopholes. They are good at coming up with useful excuses and ways to get out of whatever sticky situation they are in. ISFPs don’t mind breaking a few rules, most of the time this is what they do rather than to find loopholes. They will certainly be capable of uncovering certain loopholes, but most of the time this isn’t really how the behave. ISFPs want to do what feels right and sometimes the rules just don’t make moral sense to them. They go after what they want, and allow their hearts to be their guides. ESFPs are often more likely to break rules than to find the loopholes around them. They prefer to go for what inspires them most, and don’t like feeling held back. They follow their hearts wherever this might lead, and want to be free to make their own choices. ESFPs really don’t like feeling stuck or held back by rules, and so they often prefer to just break them.